This rope is one of my best sellers due to its quality and durability. This rope is very similar to some of the more dense Japanese jute (asanawa) costing many times as much! How can I do it at the price? Well, I had it specifically manufactured to my specification within the EU, so minimising costly shipping and taxes. 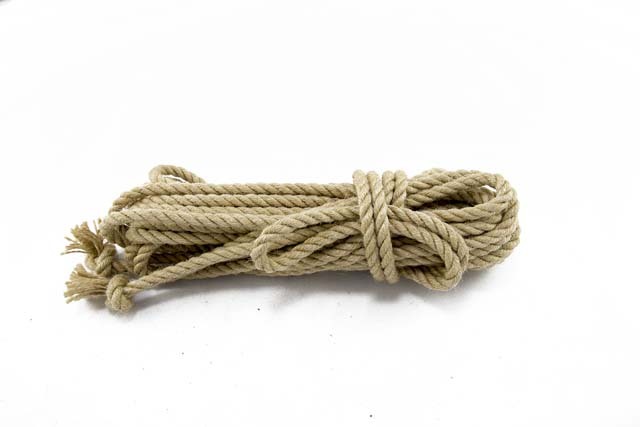 It is top quality 3-ply twisted, 100% natural jute rope, supplied as 8m (26ft approx) or 10m (33ft approx.) ropes finished with an overhand knot. The fibre ranges from pale gold to a reddish hue, depending on batch, but is always clean with minimal impurities and a slight sheen. Its tighter twist creates a stiffer rope which benefits from washing, singeing off the minimal fuzzies and treatment with oil or wax, e.g. NaWaX. However, it will break in and mature beautifully with just a bit of use. Of course, if you prefer, it is available already lovingly treated by hand. This is an amazingly durable rope which just gets better and better with use. The tight double twisted yarns mean it resists 'high-stranding', i.e. going out of balance, and is very nicely defined. The 5mm is one of my personal favourites.